After dipping on an extremely rare bird twice in two days I decided to further punish myself yesterday morning by once again braving New York City traffic on the trip from Forest Hills in Queens to Brooklyn’s famed Coney Island. To add an extra level of difficulty I brought Desi along with me for the twitch, both because he needed to get some fresh air and because an array of social service agencies look askance at anyone who leaves a twenty-month-old home alone. Of course, Desi chose Sunday to first awaken extremely early, at 5 AM, and then refuse to go back to sleep until 7 AM. Once he was asleep I got a chance to drink some coffee and check my email and get extremely frustrated by learning that the bird had shown up at 6:45 AM the day after I made an early morning run. Then Desi slept. And slept. And slept. And slept. To save time I actually put sunscreen on him while he slept, knowing that to wait for him to awaken before applying it would waste precious gull-searching time. When he finally got up at shortly after 9 AM he refused to eat anything. Figuring that no one had ever starved on a half hour car ride, I buckled him into his car seat and we were off to the land of fried dough, The Cyclone, and Nathan’s Famous Hot Dogs. Fortunately a horde of birders were on the scene including some who will be familiar to 10,000 Birds readers. Jory, our Avian Quizmaster (who is on hiatus until October), Will, and Rich were just a small fraction of the birders lined up staring at…oh yes, the gull! The guest of honor put on a show, bathing, drinking, flying, preening, and being extremely confiding and cooperative. 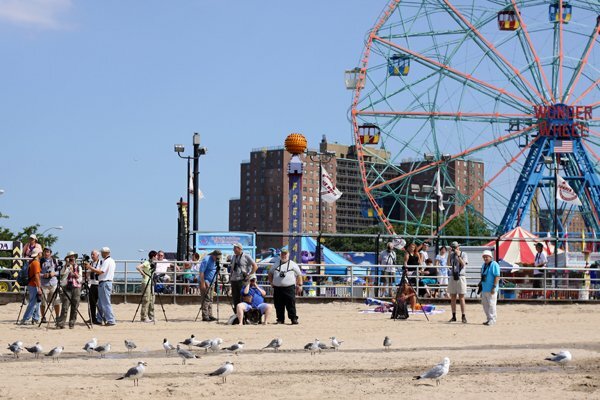 Beachgoers and boardwalk-people alike were entertained by the birdwatching horde that had descended upon Coney Island, and there was a constant stream of non-birders learning about birding. 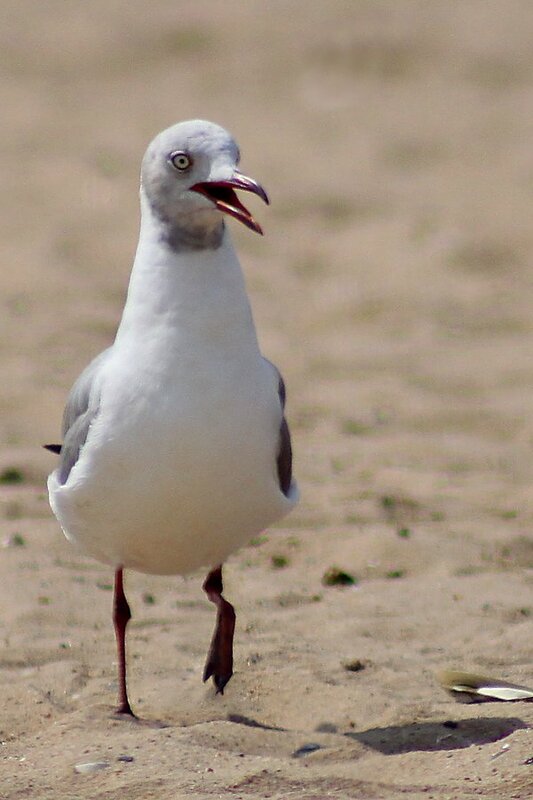 The gull didn’t lower itself to paying attention to what we lowly humans were doing. 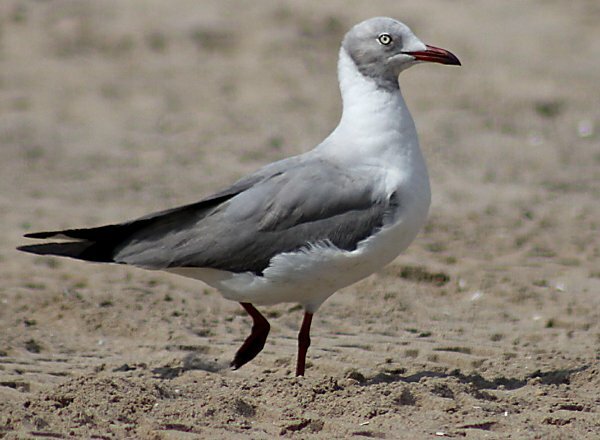 What will be the ultimate decision of the New York State Avian Records Committee? Will they accept this record as a wild bird? 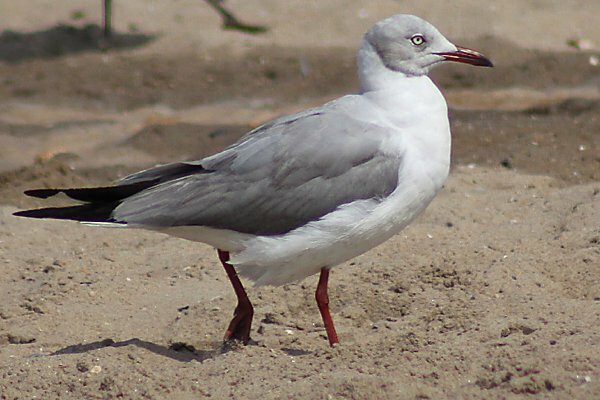 Is the gull from the South American or African population? Will the provenance of the bird be considered questionable? Will another extreme rarity with “hooded” in its name show up in New York for us to deal with? So many questions and so few answers as of yet…let’s just look at more pictures and stop thinking about that kind of stuff, alright? You took an un-fed Toddler along? Gotta go, check if anyone has updated the wikipedia pages for “Daredevil”, “Suicidal mission”, “Risking apocalypse”, and “Utter and complete Insanity”. Glad it worked out well in the end. Aside from its range, that’s a heck of a nice bird to be looking at. The eyes are incredible. Your spread-wing shot is the best one I’ve seen yet showing wear on retrices and remiges. Can you send me the unedited version? @Jochen: I don’t know how I survived. @Seth: Sure, but it will cost you. Is there any way directions can be given to those of us who have not been to coney island? Or at the least a crossroads/intersection, that would be enough as well. Thank you! Really glad you got the bird. The Inimitable Todd was at Coney Island yesterday, and added it to his life list without meaning to since it was apparently impossible to miss. Jealous. Both of the bird and the toddler who sleeps. Corey!! These photos are fantastic! I especially adore the layered one with gulls/birders/Coney I. attractions. Killer! But you do get the Daddy Medal. Loved the detail about putting sunscreen on the sleeping child; how he wouldn’t eat just when you needed him to…kids can be counted on to dash your best plans. So glad you got the bird and did your daddy duty too. This post just warms my heart. And it is a gorgeous, gorgeous bird…those lemon eyes and shadow hood! @Carrie: IT is a secret birder. He just won’t admit it. @Zick: Daddy medal? Does that come with a cash prize? Don’t forget the Coney Island-bound subways, people. Stillwell Avenue is the terminus, and it is a block from the boardwalk, almost exactly due south of where the bird has been hanging. @Matthew: Absolutely. And the subway it would have been if it the F didn’t take an hour-and-a-half from Forest Hills to Coney Island. Seriously, folks, if you want to avoid Belt Parkway traffic hop the train. 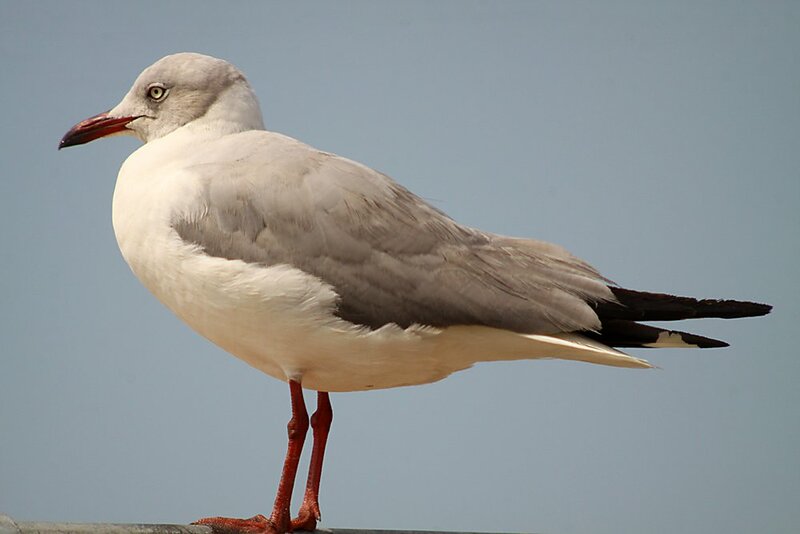 This is not a Gray-hooded Gull, it is a hybrid Ring-billed x Black-headed. 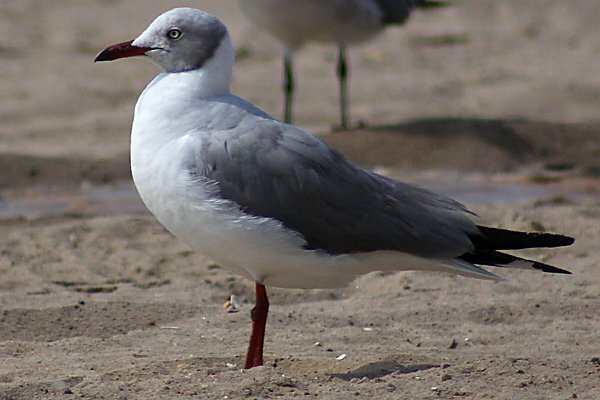 The leg and bill colouration are clearly Black-headed, bill proportions are intermediate, leaning towards Ring-billed. 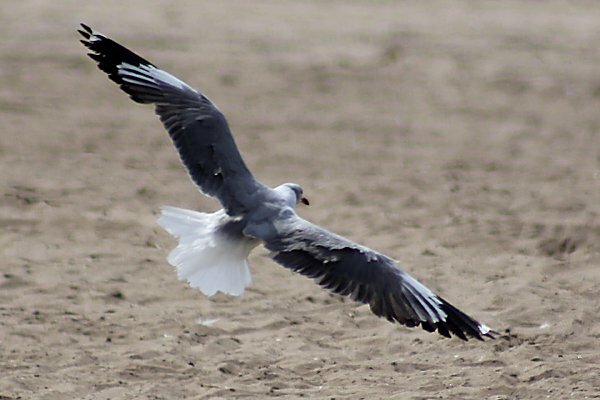 Wing-tip shows a combination of classic Black-headed with Ring-billed outermost primaries (white mirrors). 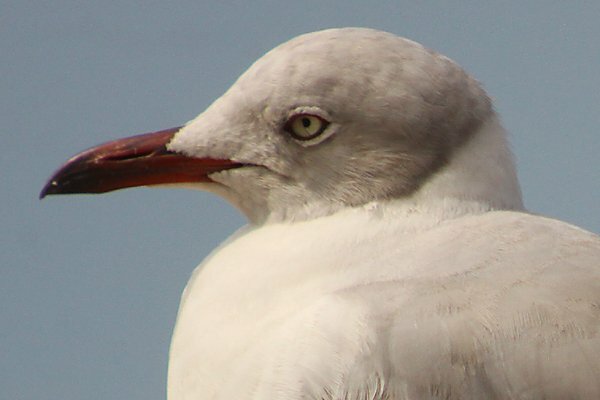 The gray hood clearly shows its hybrid character, being intermediate between Black-headed and the white-headed Ring-billed.